Kimberly Crupi Dobbins recruited two knowledgeable but silent angel investors. Felena Hanson brought in an investor and partner who would play a key role in her operation. Lucy Postins sold minority stakes to established, expert investors who would protect her sustainability values. Securing equity investment while female can seem daunting, but these three women and many more are doing it. And with careful thought, research and determination, they’re finding the equity investors and setting the terms that are right for them and their growing businesses. Most entrepreneurs use personal savings and reinvest business profits to expand. But a truly ambitious plan to scale up usually requires tapping outside capital. For most, that means getting a loan, according to the U.S. Small Business Administration (SBA). However, about 2% of business financing comes from angel investors and venture capitalists. These investors provide what can be sizable sums of money to entrepreneurs looking to seize opportunity in competitive, fast-moving industries, and sometimes supply expert advice and connections too. In exchange, they get a share of ownership and future profits. Women, though, are quite scarce in the elite equity world. Only one woman raises equity financing for every nine men, according to the National Women’s Business Council (NWBC), and women-owned businesses receive just 2% of all equity dollars, while men-owned businesses receive 18% (equally owned and public companies get the the rest). One reason: Few women are in leadership roles at investment firms — in 2014 only 6% of their top management was female. Host Sinclair Noe interviewed Kim Wales, the founder and CEO of Wales Capital and CrowdBureau, on his daily radio show during December 2015. 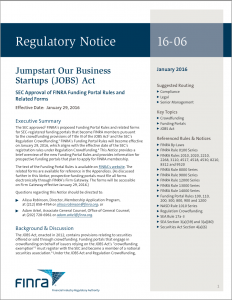 Ms. Wales and Mr. Noe discussed the Securities and Exchange Commission releasing the final rules for Title III, Regulation Crowdfunding of the JOBS Act on October 30, 2015. Their interview spans current views on what is happening in the marketplace, opportunities for investors to make their money work for them and how small businesses can find investors for their company. The market will not open until May 16, 2016. Ms. Wales reported that the SEC’s vote resulted in allowing people of all income sizes the ability to participate in equity and debt crowdfunding using a registered funding platform or a broker dealer; both will be registered with FINRA. Companies can now raise up to $1 million in a 12-month period and individuals can invest more flexibly in businesses using Title III by adhering to investor protection rules for investment limits. The playing field is now more leveled across the capital markets.